Students’ Patient Welfare Society calls for apps ! SPWS is inviting applications along with CVs for the following posts of executive and general body. Interviews will be held on 26th March, 2011 at 10:20 A.M onwards in the society office (Room No. 19 OPD). Candidates can also mail their CVs to spws@kemu.edu.pk. KEMCOL 2010 Online Edition Launched!! For the first time in KEMCOL's rich history, an online edition is being launched ! and that too before the actual release date of the paper-version ! All participants wanting to speak in Annual Interclass competition 2011 (starting from 24th March) MUST attend this camp as essential and basic information about the style and format will be imparted. I repeat, Attendance is COMPULSORY in the training camp! 1 Might is right . 2. Out of the ashes, we will rise again. 3. I have a dream . 5 . A flame of freedom will lick away the dark. Inter-Class Short Video/animation Competition With Music Show Everyone is welcome to make a Short Video/Animation . Every one is welcome to Sing, or just play the instrument ! Music Section will take auditions from singers soon. Please contact Arslan Baig , VP Music Club , for auditions and for registring your name in the singers list. --- KINDLY SPREAD THIS EVENT NOTICE to all the current kemcolians. 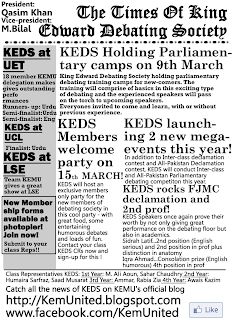 Also read the all-new KEDS newsletter !! 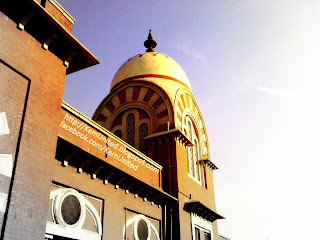 King Edward Literary Society Blogs ! Kellogs was the first blog initiative of KEMU. With contributors from all years, delve into the exciting world of Med-students at KEMU! The writers of this blog are extremely talented and the stories are pretty interesting. A must-read, if you think that literature is dead in KEMU!